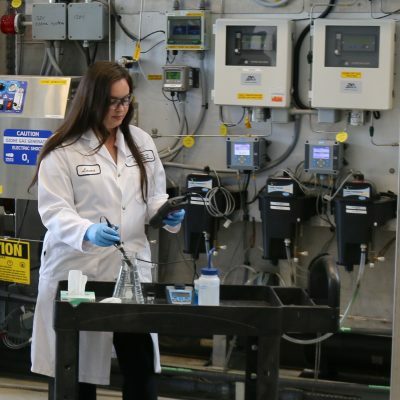 The Walkerton Clean Water Centre (WCWC) is pleased to co-host a seminar with the Natural Sciences and Engineering Research Council (NSERC) Chair in Water Treatment at the University of Waterloo, Management of Cyanotoxins in Drinking Water Treatment. Professionals, American Water Works Association and Water Research Foundation, 2016. Date and Time: September 26, 2018, 9:00 a.m. to 3:30 p.m.
For more information, or to register, please visit wcwc.ca/registration, or contact us at 866-515-0550 or training@wcwc.ca. Background: WCWC is an agency of the Government of Ontario, established in 2004, to ensure clean and safe drinking water for the entire province. WCWC coordinates and provides education, training and information to drinking water system owners, operators and operating authorities, and the public, in order to safeguard Ontario’s drinking water. Through partnerships, WCWC also provides training for the 133 First Nations communities in Ontario. To date, high-quality training has been provided to more than 78,000 participants across Ontario. For more information please visit www.wcwc.ca.